Three Dusky Dolphins give passengers aboard a dolphin watching tour with Encounter Kaikoura a close up view while visiting the South Island of New Zealand. While visiting the South Island of New Zealand, visitors should allow some time to enjoy a dolphin watching tour with Encounter Kaikoura as this is one of the best locations to view these marine mammals in their natural environment. 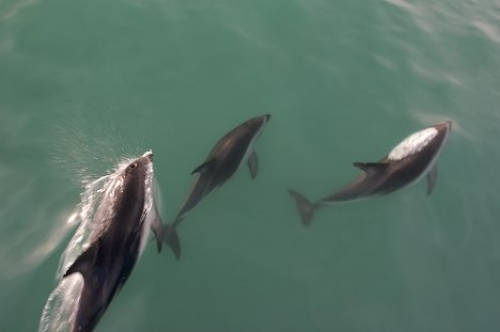 These three Dusky Dolphins give passengers a close up view as they bow ride along side the boat named Encounter Kaikoura and frolic in the wake. The Dusky Dolphins around the South Island of New Zealand can sometimes be seen traveling in small groups while other days there can be up to one thousand spanning across the surface of the water. In the waters around New Zealand, there is anywhere from 12 to 20 thousand Dusky Dolphins which leap, play, surf, rest and feed throughout the year, moving out farther in the winter to follow the food supply. The visibility of the water is good allowing passengers to see the markings on the Dusky Dolphins as they surf alongside the boat and the bubbles from their blowhole as they come up for air. The backside of the Dusky Dolphins are gray to black in color with a dark band running diagonally across the flanks from below the dorsal fin and along the tail. The underside of the dolphin is white with a whitish-gray coloring which flows over the flanks. They have very little beak because the head slopes down from the blowhole to the end of its snout. Encounter Kaikoura has been in business since the summer of 1989-1990 and the crew has become very familiar with the Dusky Dolphins. Watching these dolphins in the waters off the South Island of New Zealand makes people realize how much we should take care of our oceans to avoid losing the Dusky Dolphins or any other species of marine mammals.